An “evergreen” code for treated water facilities that is updated every three years, the MAHC is a substantial resource that can save state and local health departments the burden of researching and updating the elements of their own codes. It is available to health departments for full or partial adoption. Most importantly, the MAHC is based on science and best practices. The ultimate purpose of the MAHC is to make swimming and other forms of recreation in treated waters healthier and safer. Swimming pool experts from the public health, regulatory, industry, and private sectors are organized to provide input to update the MAHC regularly with the latest research findings through the Council for the Model Aquatic Health Code (“the CMAHC,” pronounced “the C-Mack”). “Change requests” to the code are submitted to the CMAHC executive group, followed by review and recommendations from a Technical Review Committee (TRC), and a vote by the full CMAHC on each change request. Voting results and TRC recommendations are then sent to CDC, which makes a final decision on whether to approve requested changes. For the third edition, a total of 179 change requests were submitted. According to CDC, of those, 68% (122 change requests) were passed by CMAHC voting, and of those, 94% (115) were accepted by CDC. 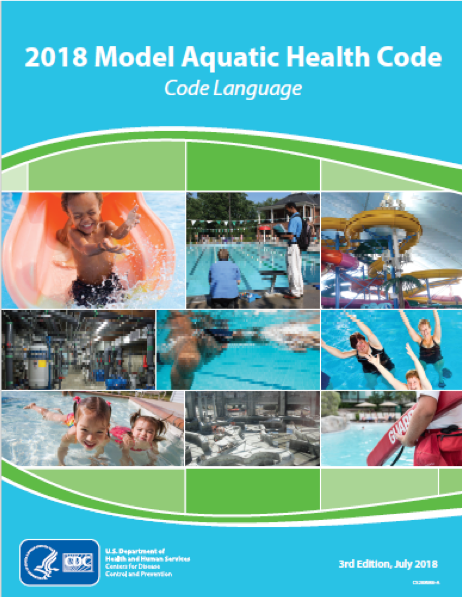 What’s New in the Third Edition of the Model Aquatic Health Code? Inhaling Legionella bacteria-contaminated water in fine sprays can cause Legionnaire’s Disease, a serious form of pneumonia. A new section of the MAHC describes in detail how to remediate Legionella bacterial contamination in an aquatic facility. Instructions are provided for the facility operator on closing down the facility, notifying the state or local public health agency, sampling the bacteria, and cleaning and sanitizing surfaces. You may have heard of floatation therapy, a form of sensory deprivation therapy, in which a person floats effortlessly on an aqueous solution of magnesium sulfate filling a bed-sized container, or pod. Conducted in the absence of light and sound, floatation therapy helps the practitioner enter a meditative state, reducing stress. The third edition of the MAHC debuts requirements for the safe use of floatation tanks, including disinfection systems to prevent waterborne disease transmission between users. The MAHC now requires lifeguards be present at aquatic venues that serve alcoholic beverages. The requirement is based on frequent reports of alcohol use as a contributing factor in drowning incidents and spinal cord injuries. Another new requirement is that aquatic facility owners ensure glare conditions are assessed and adjusted from each lifeguard position. For example, window and lighting equipment in indoor aquatic facilities must be modified, if possible, to minimize glare and excessive reflection on the water surface. As noted in the MAHC, glare increases the risk of accidents that can cause injuries or potential drowning. Have you ever been overwhelmed by the noise level in an indoor pool, (aka a natatorium)? A new provision in the Model Aquatic Health Code includes acoustic design and sound absorbing material requirements to lower noise levels in all new and substantially renovated indoor aquatic facilities. Noise can be a distraction for lifeguards. Additionally, over time, any sound that is 85 decibels or higher can cause hearing loss or other health problems. All in all, the MAHC is an impressive compilation of best practices and recommendations for treated recreational water facilities. Kudos to CDC and the entire CMAHC, who work tirelessly to improve the safety of these treasured public features. Bob G. Vincent is an Environmental Administrator in the Florida Department of Health. He manages Department of Health programs for Healthy Marine Beaches, Safe Drinking Water, Water Well Surveillance and Public Pools and Bathing Places. He also serves as secretary of the Council for the Model Aquatic Health Code. 1The first edition of the MAHC was issued in August 2014, and the second edition in July 2016. 2The MAHC Annex contains detailed rationale for the Code.